Provide comfort for the family of Sally McCloskey with a meaningful gesture of sympathy. On January 12, 2019, Sally Anne McCloskey, loving wife, mother and grandmother, passed away. Sally was born on May 29, 1926 in Beacon, NY to George C. and Dorothy Cooke Greene. She grew up in Beacon and was a graduate of Beacon H.S., class of 1945. She studied voice under Mrs. Francis Coleman, of Fishkill, NY and appeared in many local musical productions as well as singing at a number of local marriage ceremonies; the original “Wedding Singer”. She married the late Joseph V. J. McCloskey, former longtime Mayor of the Village of Fishkill, in March of 1950 at St. Mary’s Church, Wappingers Falls, NY. They had been married 65 years before Joseph’s passing. Mother to Michael McCloskey, wife Valerie of Hilton Head Island, S.C., Kathleen McCloskey Scott, husband Steven of Montgomery Center, Vt., Barbara McCloskey McIntyre and David McIntyre, Townsend, VT. And Margaret McCloskey Salamone and Anthony Salamone, Rhinebeck, NY. Sally Anne McCloskey was a Lifetime Member of the Melzingah Chapter Daughters of the American Revolution, Beacon, NY. 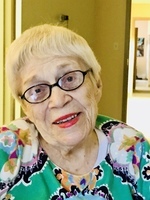 She was also a parishioner of the Trinity Episcopal Church in Fishkill, NY; former longtime Girl Scout leader, past president of the Beacon Social League and the Beacon Historical Society. Sally’s love of family, life, music, poetry and literature will stay, and guide her family, forever. Arrangements are under the direction of McHoul Funeral Home of Fishkill, Inc., 1089 Main Street, Fishkill. For online tributes, you can visit Sally’s Book of Memories at www.mchoulfuneralhome.com. Consider providing a gift of comfort for the family of Sally McCloskey by sending flowers.